NEWLY ELECTED GRAND MARSHAL MEAGAN LETTKO '20 PRESIDES over her first meeting. 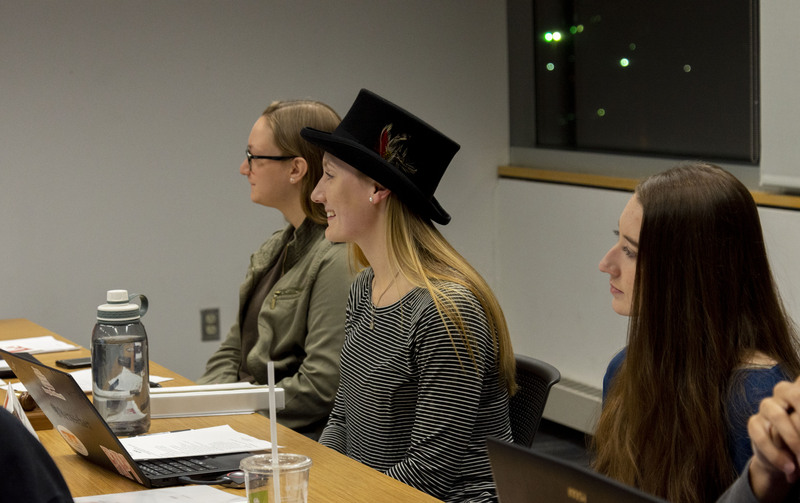 During their first meeting, the 50th Student Senate appointed an interim vice grand marshal and created a new ad-hoc committee. They also heard brief introductory presentations from Grand Marshal Meagan Lettko ’20 on the Senate and its responsibilities, as well as introductions from each of the committees present. The first motion heard by the Student Senate stipulated the appointment of former Grand Marshal Stefanie Warner ’19 as interim vice grand marshal. Warner spoke to defend her appointment: “I am the outgoing grand marshal … throughout the year I kind of realized how important Meagan’s role as vice grand marshal was, so now that that position is vacant I want to give that same support.” Upon questioning from The Polytechnic, it was explained that this position was left vacant as Lettko was elected grand marshal and has yet to appoint her cabinet. Warner assured that this appointment was not to aide in the transition between grand marshals, rather to provide consistent support to Lettko and the committees. The motion was approved 14-0-1. Heard immediately after was a motion to create an ad-hoc Arch Task Force Committee. The motion included both resolution and whereas clauses, detailing that “the Arch Task Force has been functioning since its creation to build relationships with the Arch Leadership Team and the administration, and to pursue projects related to bettering the student experience during the Arch.” The goal of the motion was to create a temporary committee to formalize the proceedings and leadership of the task force and create a space for them in the Student Senate. Both clauses of the motion passed unanimously after discussion. Farooqui explained that because of the frequency of both prayers and classes, it is almost impossible for a Muslim student to travel back and forth from academic buildings to the Union without missing class. He also explained his belief that the staircase is inadequate, since it has no added security and students are in a vulnerable state while praying. According to Farooqui, prayer mats have been stolen from the stairwell in the past. His request from the Senate was for official support of a room in the library as a dedicated religious space. The room would ideally require card access that must be applied for, similar to the allergy sensitive room in Commons Dining Hall, which would increase security and create more accountability to deter vandalism. The MSA has been circulating a petition containing roughly 200 signatures in support of the creation of this religious space. Multiple members of the Senate verbally gave support to the idea, and discussed the creation of a supporting motion to be heard in an upcoming meeting. The Student Senate holds open meetings every Monday at 8 pm in the Shelnutt Gallery.